As stated, Nepal is famed for trekking adventures. The many Himalayan terrains of the nation offer amazing trekking opportunities to all people. After all, Nepal is known as “the land of the Himalayas” and is the home of Mount Everest- the highest mountain peak on the planet. Trekkers from all around the world visit Nepal to experience an unforgettable trekking experience. Because of the many treasures that Nepal beholds, trekking is a great way to collectively experience it all in a single go! 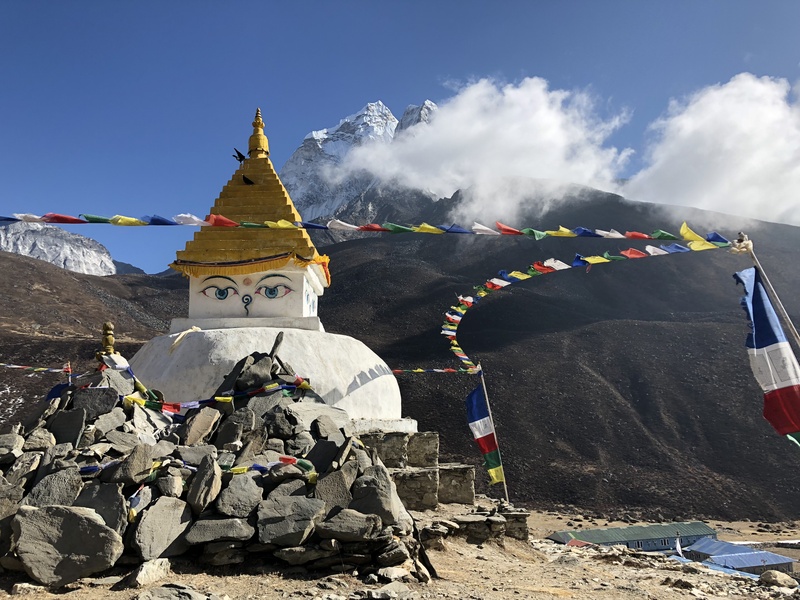 Popular trekking adventures like the Everest Base Camp Trek and the Annapurna Base Camp Trek among many others offer unique and quirky features and aspects that are unlike anything on Earth. The nation is riddled with regions and mountain valleys that all offer eccentric trekking escapades that are mixed with majestic natural beauty and religious tenor set against the shadows of the mighty Himalayas. Hiking is a great way to get away from the bustling city life and enjoy nature’s serenity. Likewise, Hiking in Nepal is also a great leisurely activity that is pursued by many people. Nepal presents many options for short hikes through its countryside. There are many destinations in Nepal that offer amazing natural settings that are perfect for hikes. Places like Annapurna Base Camp, Chisapani and Daman among many others all offer peaceful and tranquil natural environments for hikers. Moreover, many of the hike destinations are also conveniently located near the cities, making them easily accessible. Hiking along the easy trails to reach vantage points and look at the distant views of the mountains is a great way to truly enjoy the natural palatability of nature and be spiritually fresh. Everyday monotonousity of city life can have a draining impact on oneself, thus hiking is a great way to get rejuvenated as well. What’s more is that hiking in Nepal not only offers an amazing natural setting, it also presents opportunities to get close to the local countryside culture of the people. Hiking is a great workout as well, and it is blended together perfectly with the beauty of the wild outdoors and the rich customs ad practices of indigenous ethnicities. Mountaineering and Peak Climbing in the Himalayas of Nepal are extremely enjoyable and thrilling experiences. The snowy mountains of the country provide a spectacular backdrop and environment for mountaineering. Thousands of mountaineering enthusiasts from all around the globe visit the country every year to try their hand at reaching the summit of many mountains. The feel of euphoria upon reaching the summit of the mountain after going through dangerous ordeals with equipments like crampons, ice axes and slingers to climb the snowy peaks is unlike anything else on the planet. Mountaineering in Nepal is a great way to really take in the adventure spirit as the snowy vast lands of the mountains and the experience of going up through the many obstacles that climbing a mountain presents is something that is wonderfully imposing and imminent. Cultural Tours in Nepal are a matter of amazing architectural beauty and historical dexterity. Moreover, Nepal has one of the densest concentrations of World Heritage Sites listed by UNESCO. Likewise, in the Kathmandu Valley alone, there are four sites that are located close to each other. Correspondingly, Nepal is also the land where Lord Gautama Buddha- the founder of Buddhism, was born. The country still has many remnants and temples from its ancient and medieval eras that reflect its historical significance and riches. From religious temples like the Pashupatinath and the Bouddhanath to old Durbar Squares like that of the Kathmandu city, Patan and Bhaktapur- the country is opulent in terms of culture and preservation of ethnic practices that span back centuries. Not only that, Nepal is also home of the Newa Architecture- an intricate form of architecture that isn’t found anywhere else on the planet. The beautiful carvings done on the roofs, pillars, doors and the windows of the temples and old buildings present a hauntingly beautiful and unique presentation of structural anatomy. The woodwork, stone masonry and metallurgy on the buildings alone reflect much of cultural semblance and countenance that are ingrained in the lives of its people, borrowing directly from many ancient religious scriptures and legends of Gods and Goddesses. Nepal offers many options for adventure sports. From Bungee Jumping to Paragliding, adventures in Nepal are many in number. Famed adventures that Nepal is famous for also include rock climbing, sky diving and even canyoning among many. Because of the natural virtue of the country, much of the adventure sports also offer good exploration and experience of enjoying the natural beauty of gorgeous terrains. The country is drained by the ever-flowing white rivers that originate from the mountains, and together with the natural ethos of the land, adventure sports in Nepal are spectacularly savory and vastly entertaining. Nepal has several national parks, hunting reserves and protected areas established in order to safeguard and preserve its wildlife. After all, Nepal’s biodiversity is also a matter of great pride for the nation. The lush jungles and swamplands of Nepal are home to many endangered species of plants and animals. Thus, wildlife tours in Nepal are a great way to experience the pulchritude of the country’s biodiversity in a purely natural setting. Furthermore, two among the many national parks of Nepal are also listed under the UNESCO Natural World Heritage Sites list, i.e., the Sagarmatha National Park and the Chitwan National Park. The feeling of unscathed adventure as you ride on elephant-backs through the jungles to observe animals like the Royal Bengal Tiger and the one-horned Rhinoceros in their natural habitat is surely perplexing. Under the canopy of tropical woodlands and jungles, riding through the crocodile-infested rivers and lakes to enjoy the daring adventure presented by the nations many thickets and groves is an opportunity that is not to be missed! Similar to Nepal’s biodiversity, the nation is also quite rich in water-resource. In fact, Nepal is the second-richest country in terms of water-resources. Much of Nepal’s water resources are in the form of Himalayan Rivers that flow due to the meeting of the snow and glacial drainage. The white rivers of Nepal drain the whole nation and have several smaller tributaries that go on to form deep gorges and valleys embedded in the natural spanned landscape. As such, white water rafting in Nepal has steadily become a popular adventure for adventure-seekers in recent years. Nepal is also considered one of the best countries for white water rafting. The fast flowing rivers of the nation provide an absolutely thrilling ride through their ups-and-downs and swift serpentine pacing. The rivers also flow through amazing swamplands and terrains that are filled with many beautiful natural sceneries. Rivers like the Sun Koshi and the Bhote Koshi among many are quite famed for presenting a grand white water rafting sport. Conclusively, Nepal is a country that is a great place for vacations with family and friends or even solo ventures! It is a nation that has a lot to offer in terms of many different aspects. It is historically rich and naturally enticing. Visiting Nepal, at least once in life, is a must, and even then, experiencing its entire ethos in a single visit is not enough!